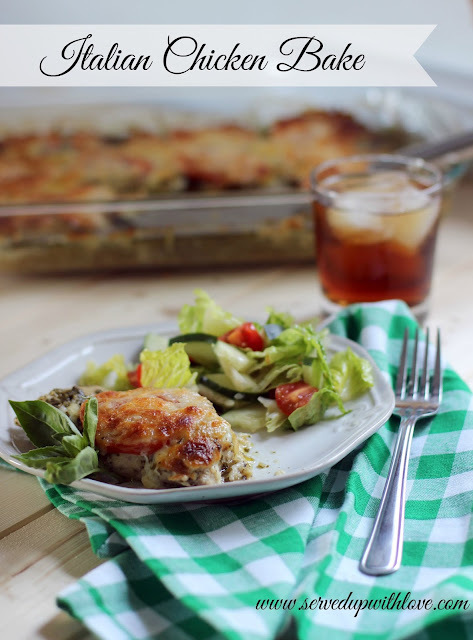 I am super happy to share with all of you this recipe today. This one really is super simple and the flavor is out of this world. Since my husband had his heart attack 6 months ago our family has been trying to make healthier changes. One of those changes is to rarely eat red meat. So we eat an awful lot of chicken and seriously after a while it does get rather boring. So I find myself dreading dinnertime. Yes, you read that right. Even this food blogger gets stuck in ruts too. I usually get a little resistance from the hubby when I try to throw something new at him. So of course, he was not too excited to try yet again another chicken dish I threw together. I came across a great deal on a pack of boneless chicken thighs and knew they would be perfect for what I wanted to try. Have you tried boneless chicken thighs? I think they are my new favorite. I used a jar of pesto in this recipe but I have fresh basil growing in the garden and plan to make my own soon. The jarred variety was super flavorful and made this dish. I can't rave enough about how good this really was. It smelled so good while it was cooking and I couldn't wait until it was done. Hubby was still a little hesitant until he tried it. Wouldn't you know it, he loved it! 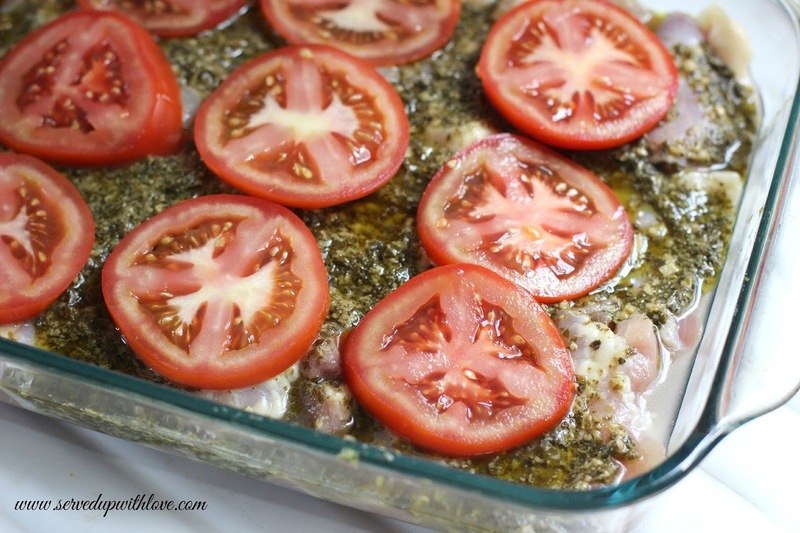 Place chicken thighs into a 9 x 13 casserole dish. 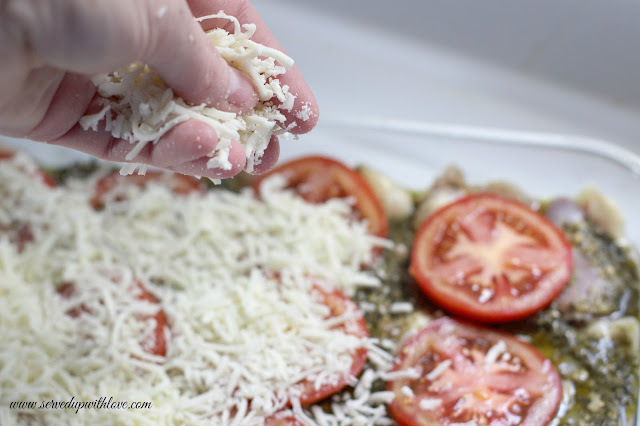 Top chicken with pesto, a sliced tomato, and cover completely with cheese. 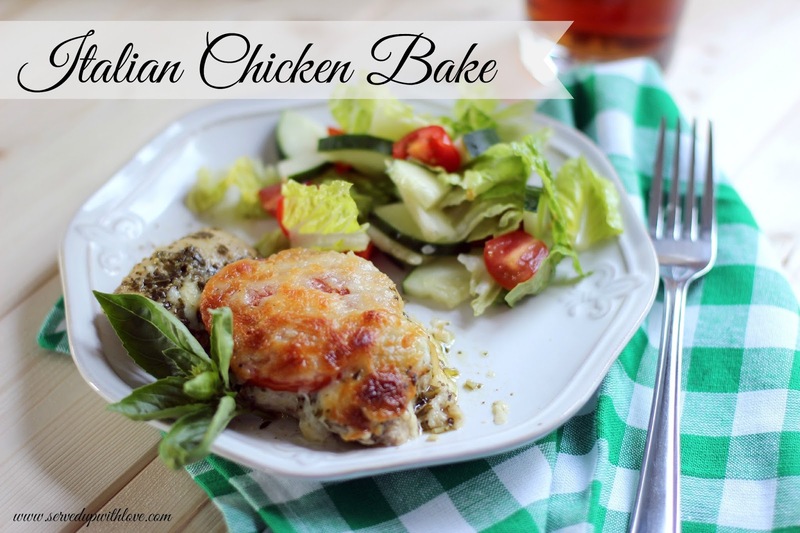 Bake at 375 degrees for 40 minutes or until chicken is done. Sounds really great. Hope your hubby's health is improving. We've walked that journey too...one day at a time...and we keep looking ahead. Best wishes to the both of you. Thanks much for sharing this with us at Weekend Potluck. Thanks Marsha, one day at a time is exactly how we approach life. He is doing much better thank goodness. I love hanging out with the ladies at Weekend Potluck. That sounds so good, have had some heath issues myself this last 15 months, being treated for cancer. I have started trying to eat healthier and your site is really helping. This sounds so good, I am always looking for news ways to fix chicken. Hope your husband improves daily. I am not too much of a fresh tomato fan. Would substituting sun dried tomatoes work? My Mom was my kitchen advice person, but she has been gone 10 years now. I haven't made it with those but I'm sure they would work just fine.